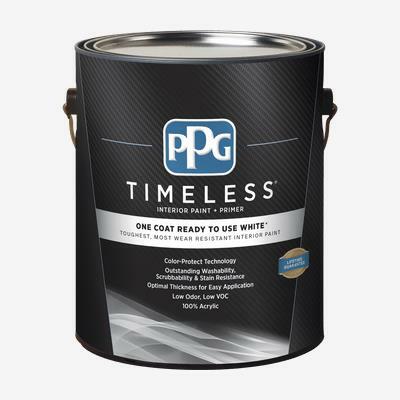 *One coat coverage only when tinted to colors specified for PPG Timeless Interior Paints. **The Toughest, Most Wear Resistant Finish is comprised of Scrubbability, Stain Resistance, Burnish Resistance and Adhesion. Surface must be dry. Remove all loose, peeling paint, dirt, grease, and any other surface contaminants. Putty all nail holes and caulk all cracks and open seams. Sand all glossy, rough and patched surfaces. When applied to an uncoated substrate, two coats are required, with the first coat acting as the primer. Uncoated substrates, repaired surfaces or lightly stained areas may require additional coats. For severe stains, water marks, and other challenging conditions such as bare metal or chalky surfaces use the appropriate primer. WARNING! If you scrape, sand, or remove old paint, you may release lead dust or fumes. LEAD IS TOXIC. EXPOSURE TO LEAD DUST OR FUMES CAN CAUSE SERIOUS ILLNESS, SUCH AS BRAIN DAMAGE, ESPECIALLY IN CHILDREN. PREGNANT WOMEN SHOULD ALSO AVOID EXPOSURE. Wear a properly fitted NIOSH-approved respirator and prevent skin contact to control lead exposure. Clean up carefully with a HEPA vacuum and a wet mop. Before you start, find out how to protect yourself and your family by contacting the USEPA National Lead Information Hotline at 1‑800‑424‑LEAD or log on to www.epa.gov/lead. Follow these instructions to control exposure to other hazardous substances that may be released during surface preparation. Stir thoroughly. When using more than one can of the same color, intermix to ensure color uniformity. COVERAGE: Up to 400 sq. ft. (37.2 sq. meters) per U.S. gallon (3.78 Liters) on primed, smooth, nonporous surfaces.